Why are fewer people getting married in church? This week saw the numbers marrying in Church has plunged to 30% in just 20 years. Christian Connection has a seven point plan for how the Church might reverse the trend and bring back Christian marriage for the majority. Jackie Elton recently spoke to several BBC radio stations about the recent news that just one in three now marries in a church. 1. Make the strategic decision – do we allow the alternative venues to control the market and allow the Churches to go into slow decline? If that is the case fit in with the venues, and allow vicars to lead prayers in the civic ceremonies as happens in Scotland and many other countries. If on the other hand we want to reverse the decline – the Church needs to be utterly committed to invest in that process and to be telling a consistent story. 2. 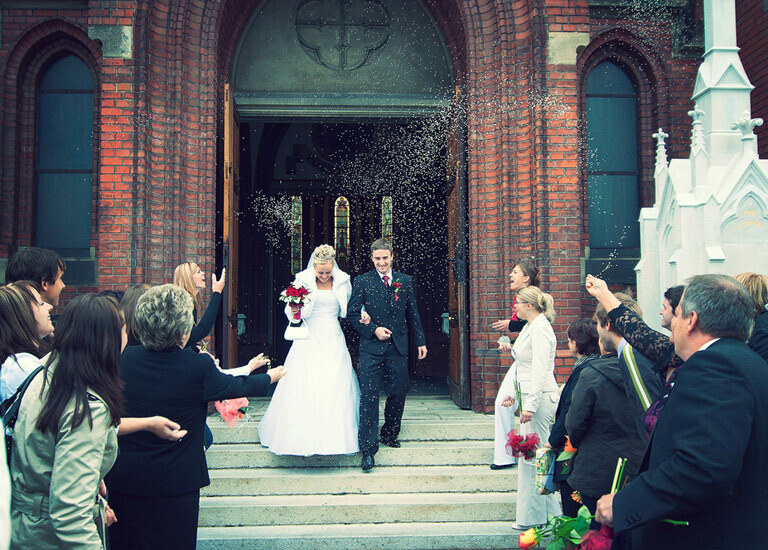 Identify and spell out the benefits of a Church wedding – tradition, long term relationship between Church and new couples, the uniqueness and beauty of a Church wedding, in the Christian community and before God and really ensure that the message thought through and understood by the dioceses and the parishes. 3. Crunch the data and work out the reasons for the change. Why are people choosing lovely non Church venues – castles, hotels, mansions, because they don’t want a Church wedding – or because the other options feel more friendly and a convenient and a one stop shop. And in many respects, cheaper. Are Churches welcoming? or not?, Complacent? A bit scary? Survey the recently married and the people who are looking to get married and find out how they made their choices and why they did or didn’t choose a church wedding. Send some real live couples out to do some mystery shopping on your behalf. When running a dating website – or any website for that matter – we had to work out what draws people to the site and what turns them off – which pages they visited or when they exited the site . Listen to feedback, observe every bit of behaviour you can and then address it. Start from long before the wedding. Single people who are connected with the Church do want to get married in Church – 90% of a recent Christian Connection poll wanted a church wedding. But they are bucking the overall trend. The evidence point to the fact that as the number of single people in society grows year by year, (1 in 3 adults are single), the Church continues to be a haven for the already married. 60% of Church members are married – compared to only 47% in Society as a whole. Or put the other way round single people are far represented in Church than in the population as a whole. Single members need to be included and actively welcomed in the Church – instead they often feel the Church doesn’t know what to do with them and many leave but many never even come in. And when they lose their connection with the Church and the Church loses connection with them and their future lives. 5. Play the venues at their own game – learn from what they are doing right and build venues for weddings so people can use the church and use your venue – or create strong alliances with the good local venues so that it becomes easier for a church wedding to be incorporated into the day. 6. Do something dramatic: Invest in and market your brand. Get the message out. There are hundreds of ways of doing it – but the Church needs to be much bolder and clearer. At Christian Connection we had a Tube Campaign – with strap lines like Christians make Better Lovers – and Another Dating Site – thank God. It was daring and a bit risky – but it got people to sit up and take notice, and challenged their preconceptions. I would love to see the Church get a top advertising brand leader to come up with some fantastic headlines and images. – “Couples Do it in Church”, perhaps.. ” Or use bold testimonial on posters, online and videos, perhaps with a few celebrities saying why a church wedding meant so much to them. Currently several church websites are silent on the subject of weddings and funerals and that in itself sends a subtle message. 7. Don’t shrug your shoulders and assume that nothing can be done to stem the tide – it can be turned around.